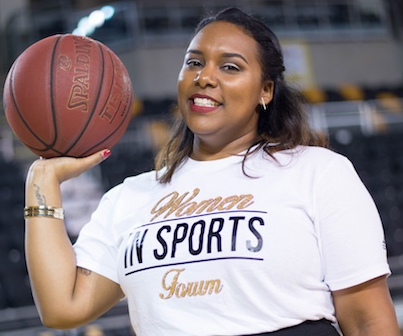 Dr Ashley Baker founded the Women in Sports Forum in 2015 and hosted the inaugural event in Detroit a year later. The second Women in Sports Forum was held in New Orleans in February this year and will return to Detroit in 2019. Ashley explains that having worked in college athletics for 15 years she determined that there were not many developmental programs or conferences that young women had access to learn about the sport’s industry and network with others. She says she wishes this was something that was around when she began her career and now wants to give back to the sport so young women will have resources and programs to help them choose their pathway. Originally from Pontiac, Michigan, Ashley holds a Bachelor of Arts in Business and a Master of Education in Sport Administration from Bowling Green State University, and a Ph.D. in Sport Management and Policy from the University of Georgia. Her research is largely centered on black mothers’ experiences throughout the college athletic recruitment process and the role of race and gender in sports. Ashley is currently the Associate Athletics Director and Senior Woman Administrator at Xavier University of Louisiana. Dr. Ashley Baker is the Associate Athletics Director and Senior Woman Administrator at Xavier University of Louisiana (XULA). She is originally from Pontiac, Michigan. She holds a Bachelor of Arts in Business and a Master of Education in Sport Administration from Bowling Green State University, and a Ph.D. in Sport Management and Policy from the University of Georgia. Dr. Baker’s research is largely centered on Black mothers’ experiences throughout the college athletic recruitment process and the role of race and gender in sports. As a senior administrator at XULA she oversees the internal business operations of the athletics department, coordinates academic support, and manages game day operations for the volleyball and basketball teams. She is also member of the university Title IX committee serving as the Gender Equity in Athletics liaison. In 2015, Dr. Baker founded Ash B. Consulting LLC to provide young women with relatable and accessible information to educate and empower them to pursue their personal and professional goals within the sports industry. Ash B. Consulting sponsored the inaugural Women in Sports Forum on April 15, 2016 in Detroit and the second forum was held in New Orleans, on February 2, 2018.